Please see this resource for ongoing updates. On May 25, Senators Paul, Murphy and Franken introduced legislation (S.J. Res 42) to block the sale. Six Representatives introduced (H.J. Res 102) -- the same legislation in the House. Congress can block the president from concluding an agreement if both chambers pass resolutions of disapproval within 30-days of notification of a proposed deal -- in this case that appears to be June 20 given an apparent delay in official receipt of the notification (May 22). In related action, Senators Murphy, Paul, Durbin and Franken introduced S.J. Res 40 to suspend certain air-to-ground munition deliveries until the U.S. president certifies that the Saudis show commitment to fighting terrorism, facilitating the flow of humanitarian and commercial goods, and to protecting civilians in Yemen. Additional sponsors have since signed onto the resolution, which would apply to precision-guided munition in this sale. A similar resolution was introduced in the House on May 25 with 6 co-sponsors -- H.J. Res 104. On Tuesday, March 14, U.S. President Donald Trump met with Crown Prince Mohammed bin Salman of Saudi Arabia. 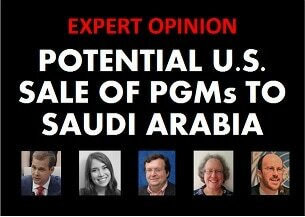 According to media reports, a week earlier the U.S. State Department recommended that the United States resume sales of precision-guided munitions (PGMs) to Saudi Arabia. According to media sources, Trump was reviewing the recommendation to resume PGM sales. On March 21, the Congressional Research Service issues a new report on the crisis. In March, civil society organizations had begun renewing earlier calls not to arm Saudi Arabia, including a letter from Amnesty International (March 13). A 2016 notification to sell tanks to Saudi Arabia garnered significant Congressional opposition. "Two years after the war began in Yemen, neither side is able to "win" and the Yemeni people are caught in the middle. Despite minor efforts by the Obama administration to rein in the Saudis by reducing some military support, the Saudi-led bombing campaign continues to wreak havoc on Yemen's infrastructure and its people, with no viable peace deal in sight. As former administration official Dafna Rand testified in last week's Senate hearing on Yemen, only once in the past two years has Saudi Arabia's bombing of Yemen measurably improved by minimizing civilian casualties - when the Obama White House ordered an immediate review of U.S. assistance to Saudi Arabia in October 2016. The source of U.S. leverage in this conflict is clear: withholding military support and weapons to the Saudis is the only way to get them to clean up their act and end this war. If the Trump administration opens the spigot of more weapons to Saudi Arabia, the United States will have less control over how the Saudis conduct themselves in Yemen, yet receive nearly all of the blame for the suffering that follows. "Two years of war has led to a humanitarian catastrophe in Yemen with no end in sight. Airstrikes by the Saudi-led coalition continue to deliberately target civilians and civilian infrastructure, showing that it's the coalition's target selection that remains the problem, not possession of better arms. The Trump administration's decision to sell Saudi Arabia precision guided munitions, which the Obama administration rightly put on hold last December, will only increase US complicity in violations of international humanitarian law, while undermining the US' ability to push for a political settlement to the war. Greenlighting more arms to Saudi Arabia shows the Trump administration has no strategy for securing US interests in Yemen and is instead outsourcing its policy to Saudi Arabia - a decision that will destroy US credibility in the region for years to come. "The Obama Administration showed little restraint in its arms transfer decisions; as Bill Hartung has documented, it set records for the quantity of arms sales agreements. The Obama Administration also focused significant time and attention on making it easier to sell weapons. A press release from the Defense Security Cooperation Agency (DSCA) released near the end of President Obama’s second term, for example, stressed DSCA’s efforts “to ensure that it [the Foreign Military Sales process] continues to effectively and efficiently meet demand.” Stressing the high demand for US weapons, the release cast arms sales as transactions, without considering the attendant risks. One of the few apparent examples of restraint was the decision to suspend precision-guided munitions sales to Saudi Arabia in response to Saudi attacks on civilians in Yemen. Now the Trump administration is preparing to walk back even this small step. Before rushing to implement what seems to be a simplistic foreign policy vision – "Saudi Arabia good, Iran bad" – the Trump administration should step back and take another look at the situation. President Trump repeatedly emphasizes a philosophy of putting "America first" and keeping Americans safe. But rather than making us safer, US arms sales support a narrative in which the United States shows little regard for civilian lives, and provides weapons that exacerbate conflicts, especially in the Middle East. Rather than making us safer, that narrative makes it easier for our adversaries to recruit and mobilize people whose mission is to attack US military forces abroad and US civilians at home. "More than two-thirds of Yemen’s population is in need of humanitarian assistance as a two-year long civil war there continues. President Trump now appears ready to send new weapons to Saudi Arabia as it engages in Yemen, despite the Saudi record of attacking civilian targets, including recently using widely condemned cluster munitions. While none of the warring parties are blameless, the stalemate today indicates that no military solution is possible. As long as the United States provides weaponry and refueling assistance to Saudis planes, the Saudis appear to have no incentive to offer a political solution. The true issue is not the precision of the weapons, but rather the targeters themselves. If this administration believes introducing more deadly devices will ramp down conflict and address urgent humanitarian needs, it should make that logic clear. Instead, new arms sales that appear likely to be used against civilians, coupled with travel bans that appear to inhumanely block those seeking to escape the conflict, are likely to radicalize people against the United States. Much better would be for Trump to promote the portion of U.S. conventional arms transfer policy that includes the goal “Ensuring that arms transfers do not contribute to human rights violations or violations of international humanitarian law.” Now is an opportunity to signal to Riyadh that it must act responsibly and ensure that future U.S. arms transfers are not used to target civilians and violate human rights.